Welcome to a smart, clever and handy idea, which will help to keep you warm throughout the year, whatever the weather. Caverill has been successfully designing and making heat products for over 20 years and won the prestigious New Product Award in 1999 at the International Garden and Leisure Exhibition at the NEC Birmingham. We are now pleased to introduce you to our range of products, including the heat packs that have a washable slipcover and come in many designs – something for everyone! Cereal filled heat packs have been used down the centuries to keep warm on cold nights and to offer comfort when poorly. Our products have been tested, not only for safety, but also for durability, by a leading independent British Testing Laboratory, and our heat packs are filled with 100% naturally treated cereal in a cotton covered insert, channelled so the cereal may be massaged through to hug the natural body contours. We have four designs of microwaveable heat products: The Hot Bot, Nature’s Heat, Aroma Heat and, not forgetting your pet the Snoozie Paws. 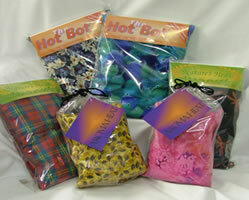 All of our heat packs come with a washable cotton slipcover, in a range of designs. Our heat pack products are handmade by the Charity at our Caversham warehouse. We cut, sew, fill and pack ready for our customers to order. 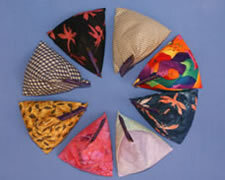 All our heat packs have a discreetly channelled design to ensure a constant, even distribution of oats. They will snuggle comfortably into the body’s natural contours, to give relief and help relax muscles knotted by injury, inflammation or everyday living. To heat, place the heat pack in a microwave for the required length of time (full instructions included). Microwaving heats the starch within the husk of the grain; the stronger the husk, the longer both the heat and the product lasts. Caverill use only oats, which have extremely robust husks, unlike wheat or rice, often used by other manufactures of heat packs.. When first heated our heat products will give the pleasant smell of baking bread, which will lessen with use. Condensation may appear; gently shake the heat pack and it will evaporate. During this period we recommend that the slip cover is removed before microwaving. All our heat products come with full instructions on use and care.